She grew up in Kampala, one of the poorest places on earth. She couldn’t read or write. As a child, she scrounged for food each day, and without money for school fees, she lived on the streets. 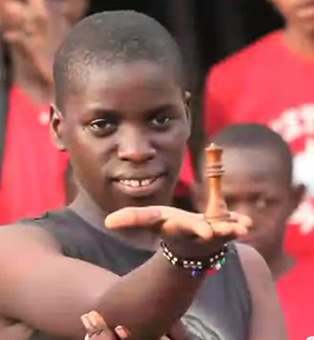 But a chance encounter with a Ugandan chess coach turned her into a rising international chess star, the subject of a book — and the protagonist in a future Disney movie. The Christian missionary had started a chess program in the Katwe slum that offered a bowl of porridge to any child who would sit through chess lessons. From the time Mutesi first showed up in 2005, her extraordinary aptitude was clear. Now 16 years old, she goes to school, has the drive to become a doctor, and has already represented Africa in the Chess Olympiad in Siberia.